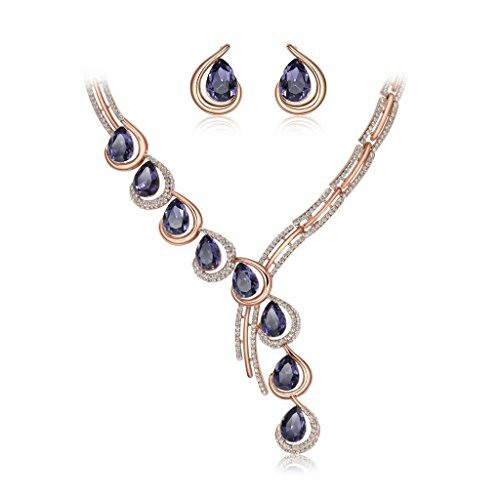 Rose Gold Plating Made with Austrian Crystal .Necklance and Earrings Luxury Jewelry SetsThis elegant design will help you look more beautiful. Match with suitable apparel for different occasion.It is the perfect gift for you or your lover. The picture might vary in color compared to the actual jewely due to differents lights and monitors.the picture is only for reference.The sample used for measurement may have a slight variance in size with each product.Also the saample product from the manufacturer may different slightly in size and color because of reproduction. IUHA is trend leader in Necklaces & Pendants & Earrings & Ring. IUHA Jewelers are styled primarily in alloy or sterling silver and feature captivating crystals, pearls, or gemstones. From the classic to the unique, from sophisticated necklaces to fashion statements there's always a stunning choice for everyone. If you have any questions about this product by IUHA, contact us by completing and submitting the form below. If you are looking for a specif part number, please include it with your message. 14K Solid Yellow Gold 1.5mm Cuban Curb Link Chain Necklace- Made in Italy- 22"
18K Solid Yellow Gold Diamond Cut Round Cable / Anchor Chain Necklace- perfect alone or for pendants-16"